The AIDS epidemic, one of the most significant public-health events of the late twentieth century, continues into the twenty-first. The statistics are horrifying—according to UNAIDS, in 2015, there were 36.7 million people living with HIV; since the start of the epidemic around 78 million have become infected with HIV — and the financial and social costs are staggering. San Francisco was particularly hard hit by AIDS, and community-based organizations (CBOs) began to develop here early on to care for the sick and the dying. Beginning in the mid-1980s, San Francisco witnessed the development of a highly effective collaborative network of city and state agencies, hospitals, health care providers, and CBOs. The longstanding partnership between UCSF and SFGH was integral to the success of this effort. Through a goal of putting patients first, clinicians and nurses at Ward 86 at SFGH helped establish the “San Francisco model” of compassionate AIDS care that has become accepted as the worldwide standard. 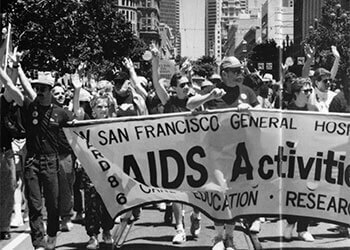 The UCSF Archives and Special Collections department has played a key role in documenting the AIDS epidemic. In 1987, the Archives & Special Collections initiated, in collaboration with the Gay, Lesbian, Bisexual, Transgender Historical Society (GLBHT HS) and University of California, Berkeley, the AIDS History Project. The purpose of this initiative was to actively collect and organize papers and records of healthcare practitioners, activists, organizations, and agencies, and to promote the preservation of historically significant resources related to the beginning of the AIDS epidemic in San Francisco. Recognizing the need for a broader initiative, the collaborators organized a national conference in March 1989. This conference addressed the need to forge relationships between historians and the AIDS community throughout the country in order to document and preserve the lessons and experiences of the AIDS epidemic. In 1991, an NHPRC grant funded the AIDS History Project Records Survey, in which archivists surveyed more than fifty agencies, identified records to target for permanent preservation, and developed an acquisition plan. A second NHPRC grant in 1993 funded the records acquisition and processing phase. In 2004, NHPRC supported the AIDS Epidemic Historical Records Project, a collaboration of A&SC and GLBT HS that resulted in processing of 18 existing and newly acquired collections. In 2016, NHPRC funded an expansion of the AIDS History Project and supported the creation of detailed finding aids for seven recently acquired collections. In 2017, UCSF Archives, in collaboration with SFPL and GLBT HS, was awarded an implementation grant from NEH to digitize material related to the early days of the AIDS epidemic in the San Francisco Bay Area.